Oh No, Ohno – say it isn’t so! Parting is such sweet sorrow…or more accurately, just bittersweet. Apolo spent his last moments on the ice, hugging his teamates and shaking hands with his competitors. It looked oh so much like a final goodbye – to the competitive ice, to the cheering fans, to his teamates and coaches alongside which he has toiled, to all those competitors of other nations he has spent years winning and losing against for over a decade, and finally, a long, heartfelt hug to the father who has been there through it all. Will this be the last flight of Apolo on Olympic ice? It truly appears so. One never knows, two years from now, when the summer Olympics will be in full swing, he may once again hear the siren’s song of competition – and decides to give it one more go. I have no doubt it will only be if he feels he can step up on the podium once again. Such an athlete is not satisfied just to compete…but believing that they have the ability to win. Would he have liked to leave the games with another gold or two? Only he knows for sure. That I would have wished only for himself. He walks away with a handsome haul, a feat in and of itself. 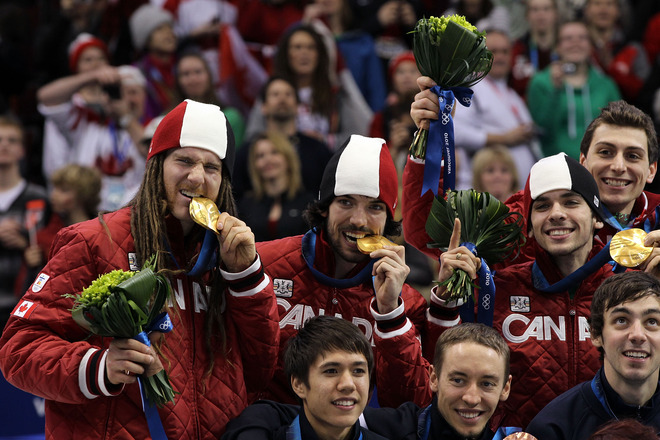 What I as a fan am most proud of him for, was leaving it all out on the ice for the men’s relay. Giving his all and helping to send the entire men’s team home with a medal. Certainly he had enough accolades and trophies of his own. If he is truly going to leave the competitive skating world, I’m glad it was on this particular high note, and it was one he could share with all his teamates. So farewell Apolo, if this be the end. Congratulations on 8 career Olympic Medals. You will be sorely missed on the slippery and wily ice. We will continue to follow your career, whether you are dancing with the stars…or merely wishing on them. May good fortune follow you wherever you go. PILE UP: Apolo Ohno skates into mayhem on the last turn of the men’s 500-meter short track speedskating final at Pacific Coliseum. 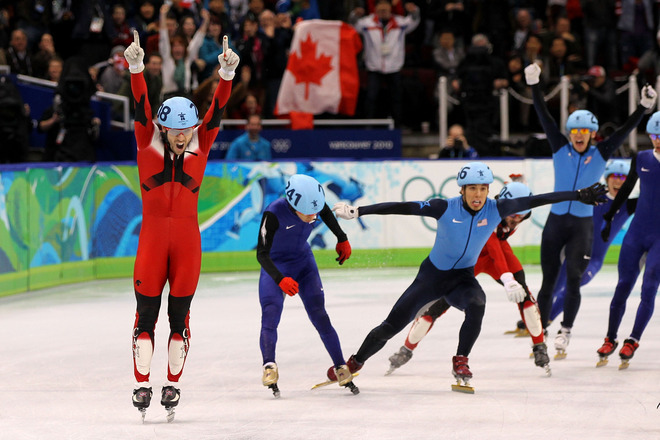 Ohno crossed the finish line second, but was disqualified for pushing Canada’s Francois-Louis Tremblay, causing him to slide into the wall. 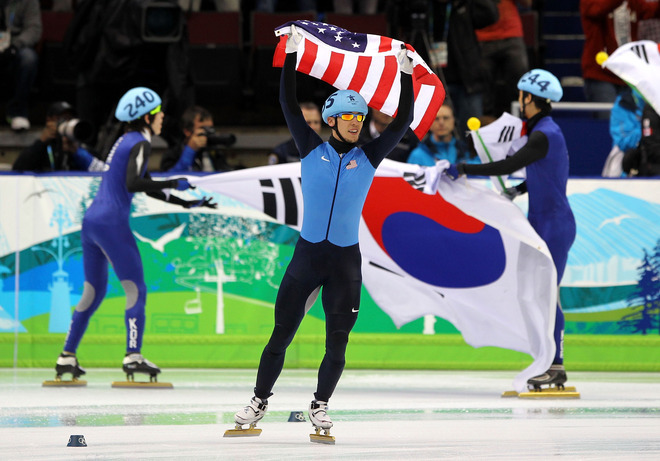 Korean skater Sung Si-Bak was leading, but tripped on his own. 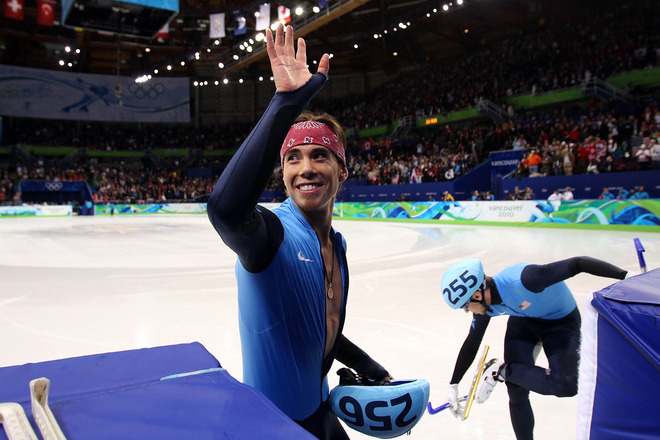 Bronze medalist Apolo Anton Ohno of the United States holds up eight fingers to signify his tally of Olympic medals after the Men’s 5000m Relay Short Track Speed Skating Final on Feb. 26. USA won gold in the event. 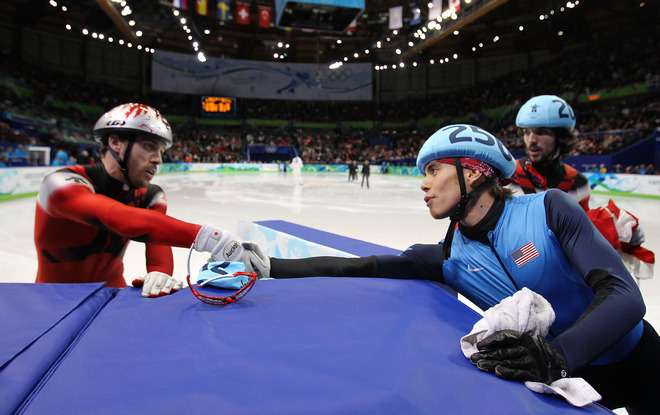 VANCOUVER (AP) — Apolo Anton Ohno threw up his arms in a what-can-I-do gesture and smiled. 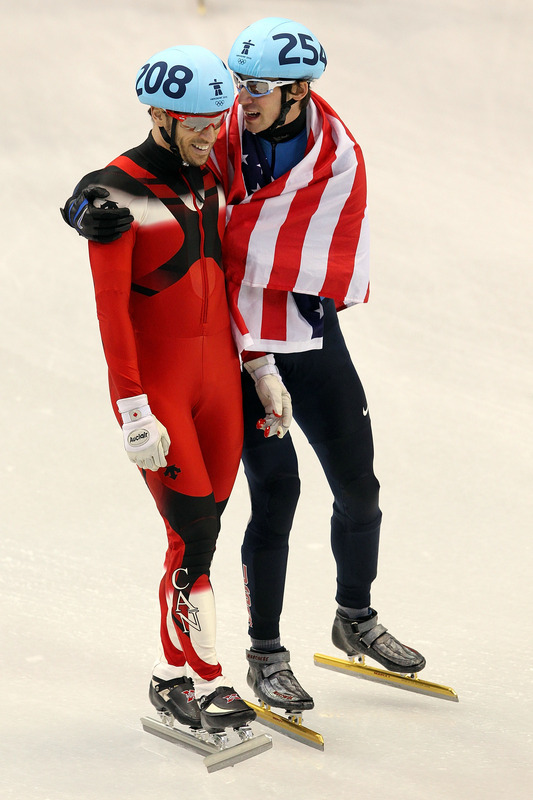 The American short track speedskater had just been disqualified in the 500 meters, but he wasn’t leaving the Vancouver Olympics empty-handed Friday night. Ohno returned later and anchored the United States to a bronze-medal finish in the chaotic 5,000 relay, giving him his eighth career medal. It was Ohno’s third medal of these games, to go with a silver and another bronze that made him America’s most decorated Winter Olympian. 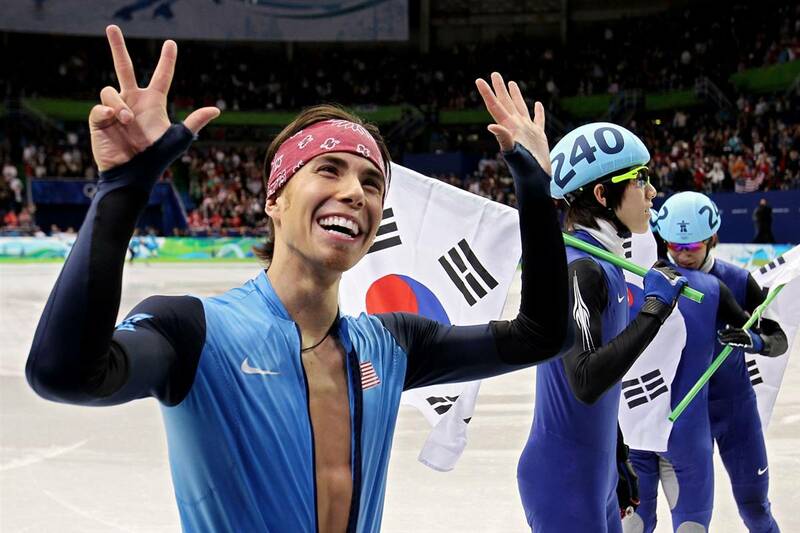 He already has the most short track medals of any skater. 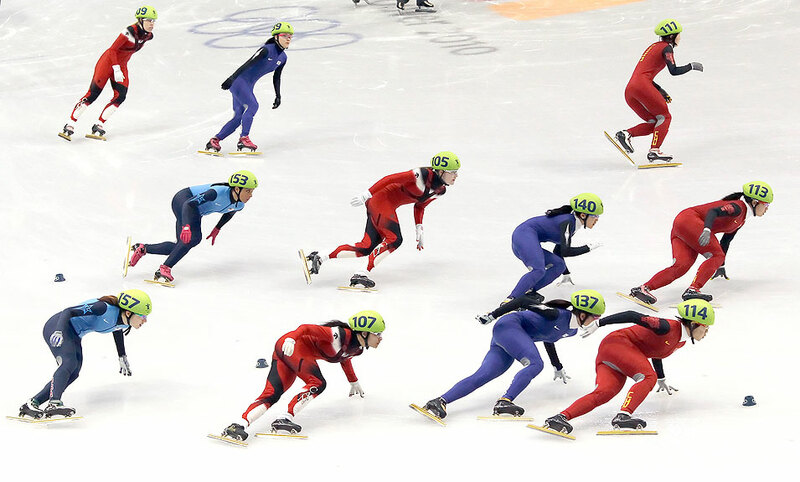 The 45-lap relay ended a wild final night of short track, marked by crashes, disqualifications and capricious skating. It also might have been the final Olympic race of Ohno’s stellar career. 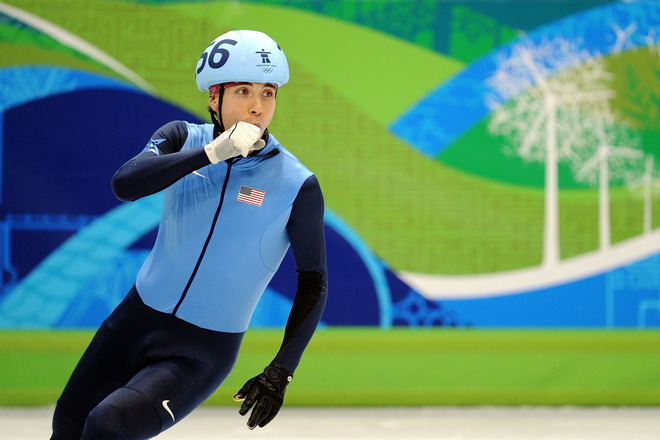 He is contemplating retirement, although U.S. national coach Jimmy Jang is hoping to convince the 27-year-old skater from Seattle to compete in a fourth Olympics in 2014. Men’s Relay Final! Oh What a Ride! I haven’t even BEGUN to sift through my google alerts, and since photos tend to disappear rather quickly, I sure do want to make sure that these are not lost to posterity. Too many to post here, I will add them all to the Vancouver Olympics thread on the Boots and Blades forum as I can. 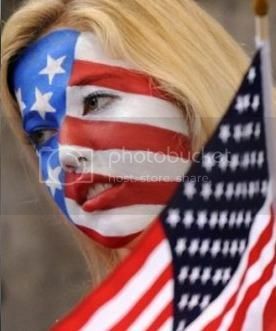 Congratulations to all the teams, but of course, mostly to our U.S. Bronze Medal Winners. I know I speak for everyone in the states when I say we fans are ecstatic that every single member of the U.S. Short Track Team will be going home with a medal from this Vancouver Winter Olympic Games. 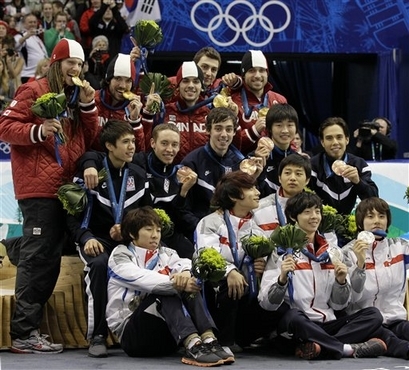 So here’s to you our fine young men: Travis Jayner, Jordan Malone, Simon Cho, J.R. Celski and Apolo Anton Ohno. This has been an amazing Olympic Games, some serendipitous highs, some heartbreaking lows, and in the final moments, a happy ending for everyone. We couldn’t be more proud of you, or more touched by all of you and your willingness to share the experience with us. Thank you for taking all of your fans along for the ride! Many more photos here on Yahoo sports, and they tend to disappear after a day to make room for the next day’s photos. Katherine wins Silver in the 1000m! But enough excuses! We’ve got some great news to report! Starting with Katherine Reutter. As we all sat on the edge of our seats for the women’s 1000m, a panning of the camera up in the stands at the end of the semi finals landed on Katherine’s parents, and I think Beth Reutter might have lost a year or two off her life on that one! Clearly, she hadn’t drawn breath during the entire race and finally exhaled in a massive sigh of relief as Katherine sailed across the finish to qualify for the next round. It’s the A final- It’s now or never. 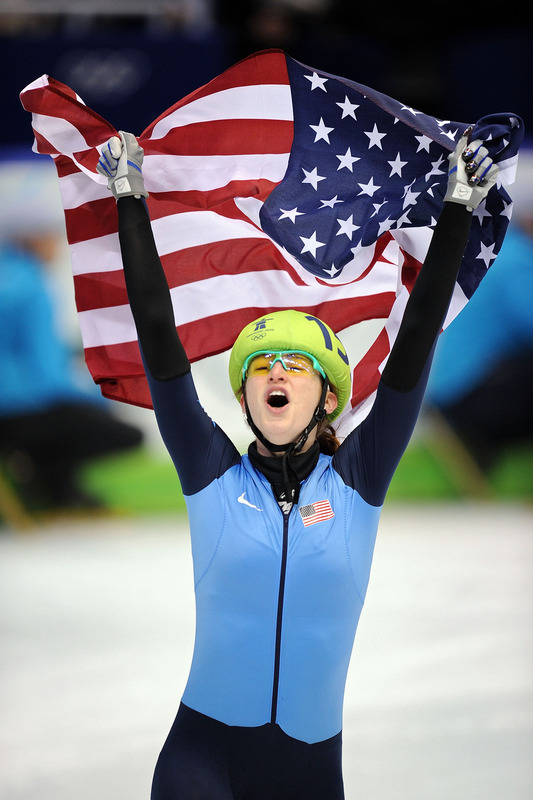 After crossing the finish line for the silver, Katherine’s yell of personal victory was almost primal. This was her last chance, two weeks of competitions of ‘not quite – but almost’ finally came to fruition. And all of the weeks cares and frustrations flooded out of her in one jubilant rebel yell- an emotional release of all she had worked for and sacrificed, for this opportunity to revel in this one moment. 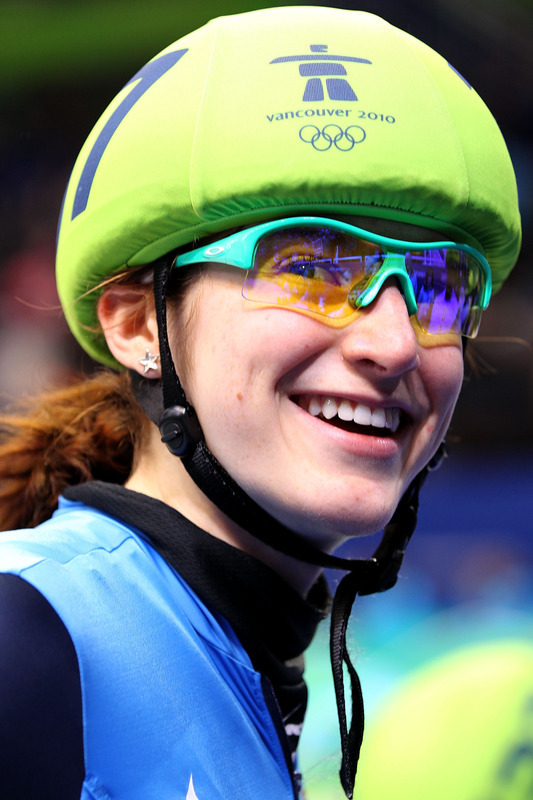 Congratulations Katherine on a Silver Olympic Medal! It was well fought and hard won. 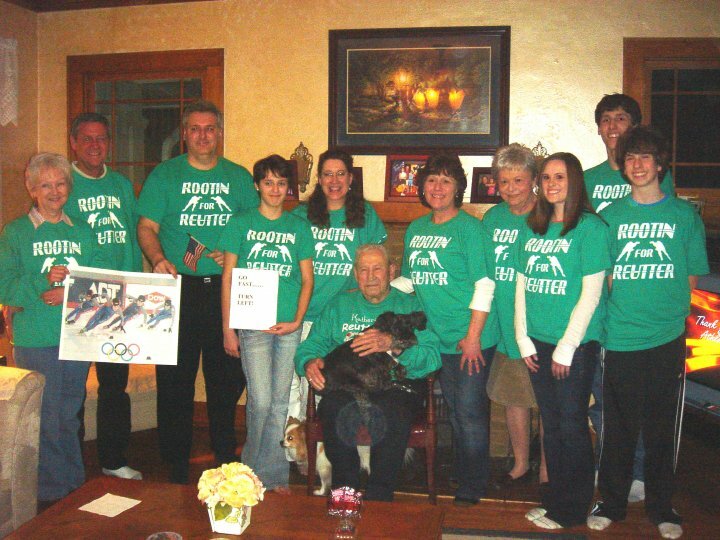 For every Olympics, there are memories not only for the athletes, but for those of us who watch on the sidelines. Memories of the Olympic Games we will hold in our hearts forever. Katherine’s silver medal race will be one of them I will add to my collection. But that memory – and this Olympics has been especially meaningful. This Olympics has been a bit more personal, for not only me, but for many fans. 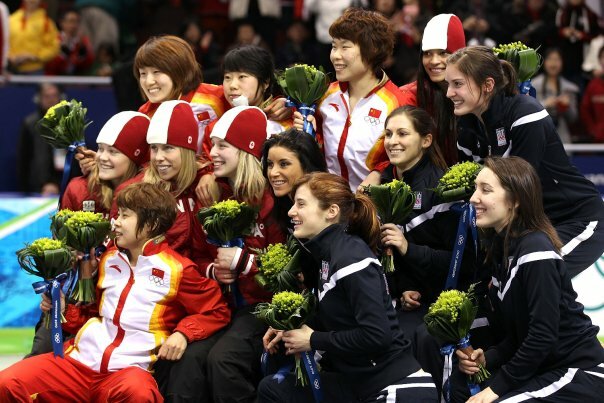 This Olympics, we have had the pleasure of meeting some- if not all – of these wonderful skaters and their parents. We cheered ourselves hoarse in the stands, and followed their careers on the way to this ultimate goal. With the plethora of social media, they in turn could include their fans on their journey. 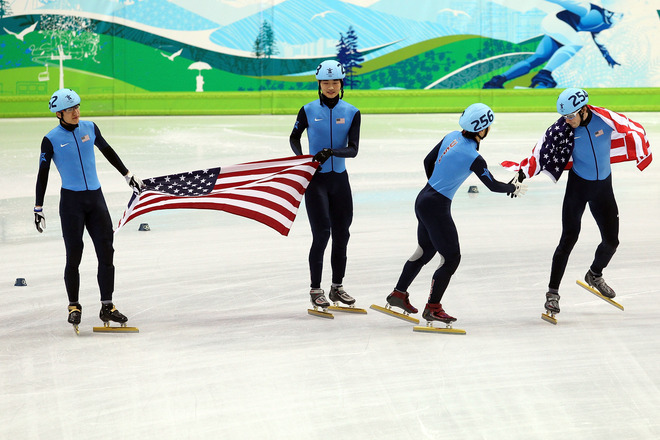 So Congratulations Short Track Team USA, job well done! You did us proud, as always. 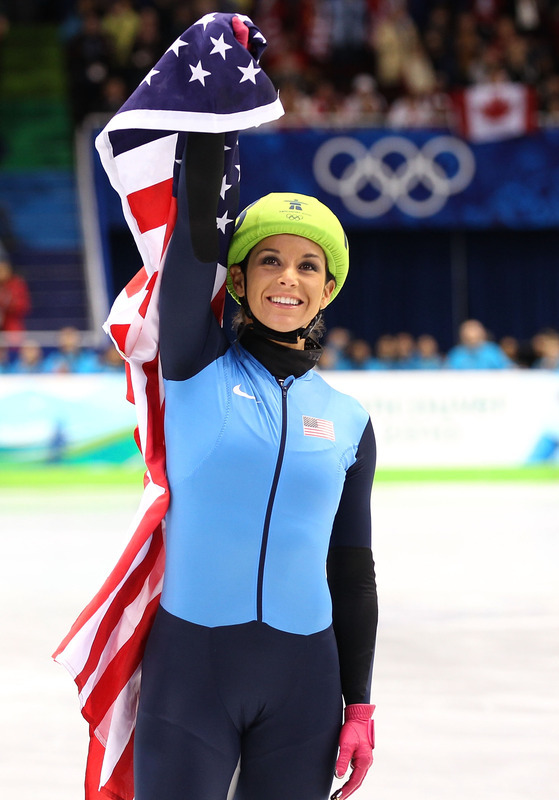 VANCOUVER — With her mother crying and shaking her head in disbelief in the stands at Pacific Coliseum, St. Louis-trained short track speedskater Katherine Reutter circled the ice flapping an American flag, pumping a fist and shouting from the depths of her heart after winning a silver medal in the women’s 1,000-meter race on Friday night. Whatever she was hollering wasn’t immediately discernible even to her mother, Beth, who sat with her husband, Jay, and her own parents, Lee and Fern Doublin, former residents of Woodson Terrace. With “every emotion, every bit of hard work I’ve ever put in” surging through her and bursting out all at once, Reutter couldn’t just stop there. Short Track Schedule: It’s ‘GAME ON’ again tonight! Lots of great videos, slideshows, photos and info here leading up to tonights festivities! 9 medals awarded tonight! Yes, It’s Ladies Night! Oh What a Night! Allison Baver, Kimberly Derrick, Alyson Dudek, Lana Gehring and Katherine Reutter show off their bronze medals from the women’s relay. 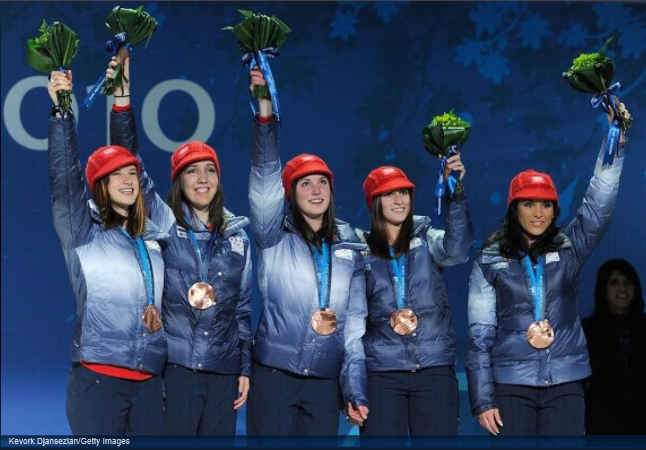 nbcolympics.com – womens relay slideshow. 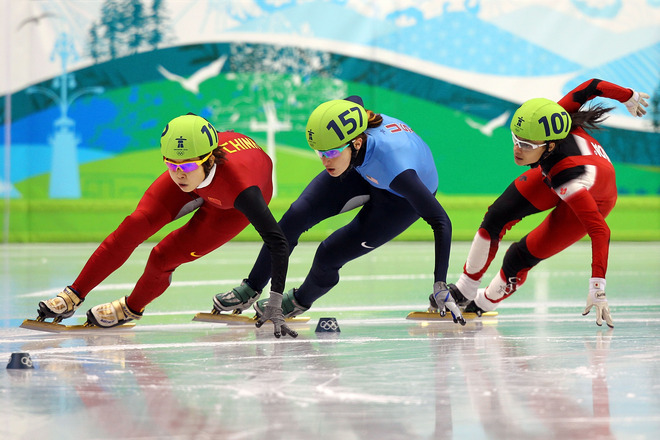 VANCOUVER – When short-track speedskaters need a fix, Tony Chung is their pusher. Nah, it’s not what you think. 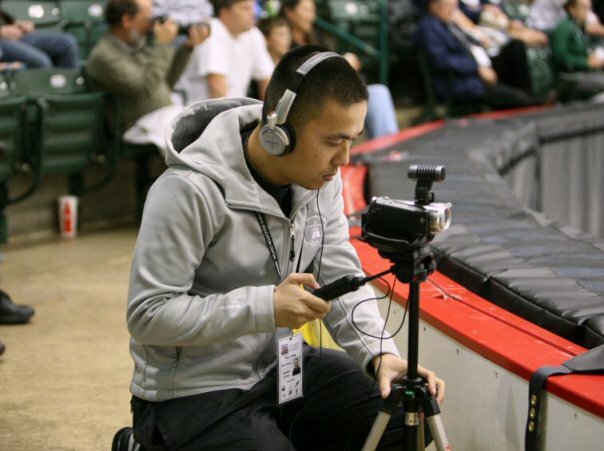 Athletes go to Chung’s cult website http://www.shorttrackHD.com or YouTube for his exhaustive amateur coverage of almost every major event in the sport. You want to watch an example of “team skating,” a cheating method notoriously hard to prove, Chung’s got some tape for you to see. You want to check out Canadian Olivier Jean execute a bad pass in the last World Cup competition in Michigan, Chung was there. 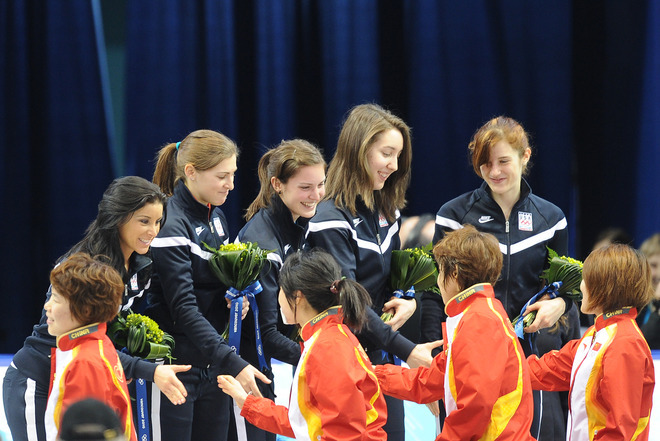 Chung was the only person to make full, HD coverage of the Canadian Olympic trials available to the general public last summer. 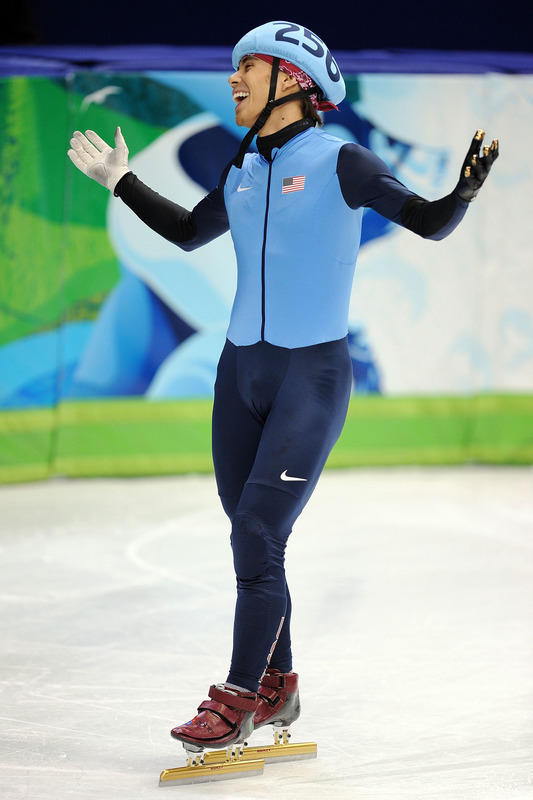 The weird thing is, Chung is an IT worker from San Leandro, Calif., who has only speedskated for pleasure. 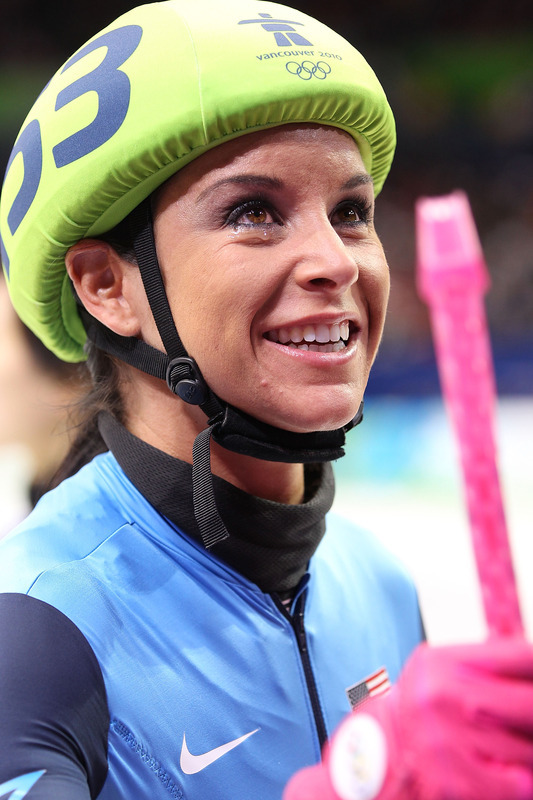 So what makes the 26-year-old want to be the Perez Hilton of the short-track world? A desire to expand understanding of the sport and help athletes, he says. “I’m a one-man army. 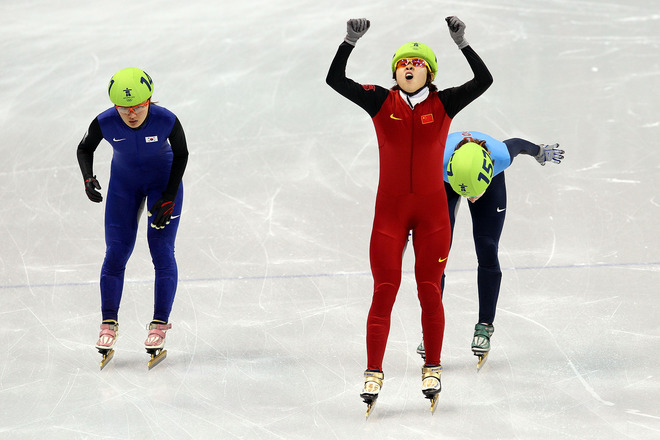 I do everything: record, edit, tweet, website, just me, no help from any outsiders,” says Chung, who is in the stands for every short-track race in Vancouver. He posts his analysis after every day of racing — he can’t film at the Olympics. Time video on Jordan Malone and his dog Oly. We’ve all fallen in love with Oly ages ago…but it’s nice that the rest of the world is being introduced to the Oly dog! 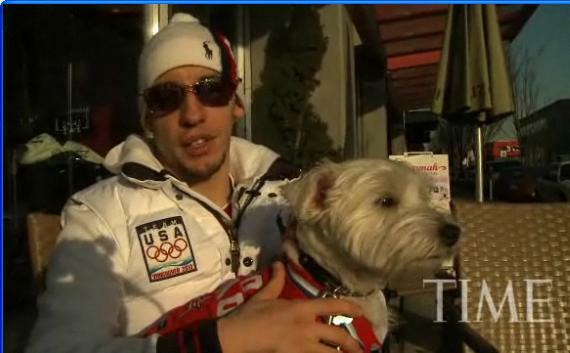 U.S. speed skater Jordan Malone has had some tough breaks at this year’s Olympic games, but he says his dog Oly never fails to cheer him up. 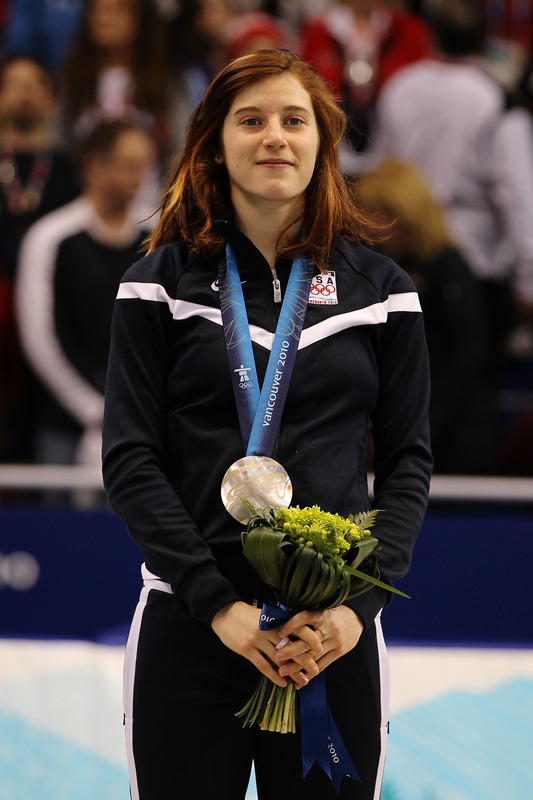 You are currently browsing the The Ice & Times of Short Track Speedskating blog archives for February, 2010.